If you're not satisfied yet with the barrage of Dragon Quest games (both available and upcoming) for the DS and DSi, then meet Dragon Quest Wars. This strategy game is brought to us by none other than Square Enix features online play and is available for DSiWare download for only 500 points. Dragon Quest Wars looks and plays like a board game featuring Dragon Quest characters. 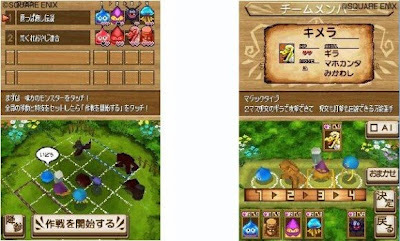 Up to four players can battle it out, forming their own team of four Dragon Quest monsters. There's nothing to worry in terms of gameplay, since the game is being developed by Intelligent Systems, the guys who made the Advance Wars and Fire Emblem series. It will be out in Japan this month.